Some venues (and budgets) are better suited for smaller groups like the Hotlanta Trio. Playing all the same great music as the six-piece band, the trio can perform in a wide variety of situations and be mobile if need be. 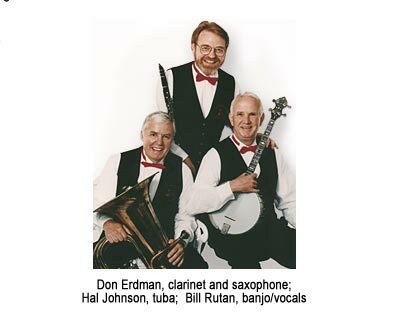 You still get those same great vocals from our banjo player, Bill Rutan, and that wonderful solid bass from our tuba player, Hal Johnson, and clarinetist, Don Erdman, provides added color when he brings along his soprano, tenor, and baritone saxophones. They have 3 CD's out, The Hotlanta Trio, Vol. 1 and Vol. 2. Bob Erdos, of Stomp Off Records reviewed the recordings and called them"...immensely entertaining! In addition to the good musicianship, I thought the recorded sound was excellent, full and rich with good 'presence.' They will afford much enjoyment to those who hear them." The Trio has recently released Keepin' Out Of Mischief, a collection of eighteen cuts of classic jazz tunes, including some rarely heard gems. If your party, special event, or concert needs some great jazz with a Southern accent, check out both the trio and the sextet. Free demo packages for either group.